So I’m thinking about making an Imogen dress for my Nieces wedding in June from some gorgeous Crepe fabric I got for my Birthday from my Husband. 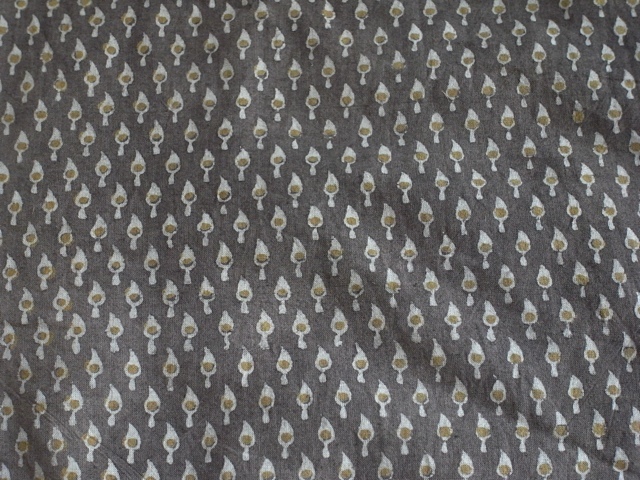 I decided I ought to make a trial run, so chose this lovely jersey fabric I had in my stash from last year. 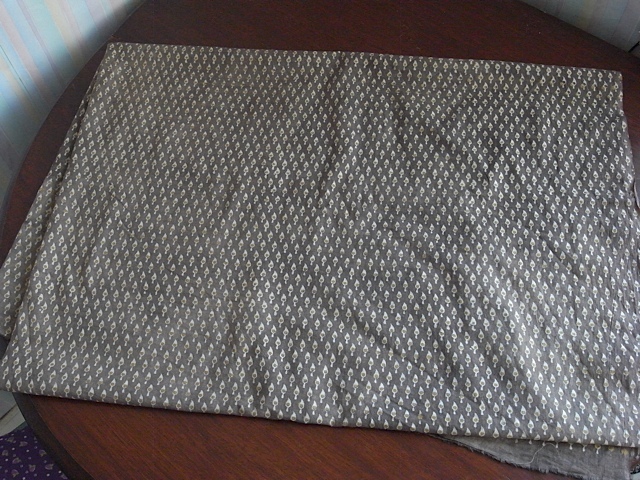 This was a very fine jersey fabric and as such was quite tricky to work with. It kept wanting to slide off the table and I had to use millions ( I do not exaggerate) of pins to get it to stay in place, I thought this would be good practice as the crepe fabric I want to use will be quite tricky too. It went quite well all in all, except for one side of the collar that doesn’t lie quite flat enough. I can live with it though. The fabric drapes beautifully. 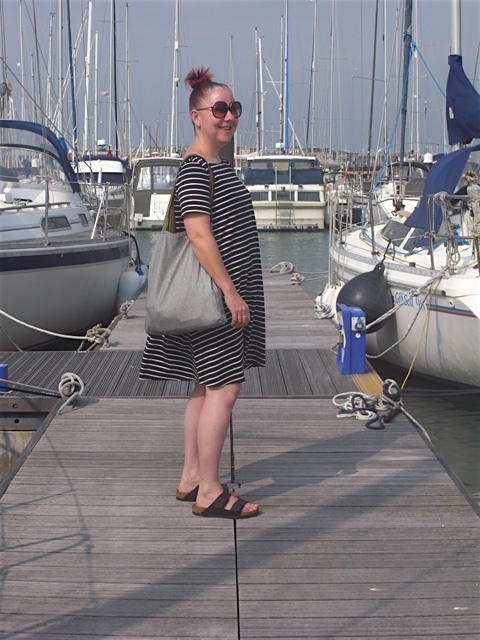 However I wasn’t too sure I liked this pattern as a dress and very nearly turned it into a top this weekend, but I tried it on again with my trusty Birkenstocks and decided it would be perfect for those summer days when its too hot to wear too much! And if I do make a dress for the wedding it will be a tad shorter. I haven’t quite decided yet if I want to make the fabric into a dress or if I want to get a couple of tops out of it instead. 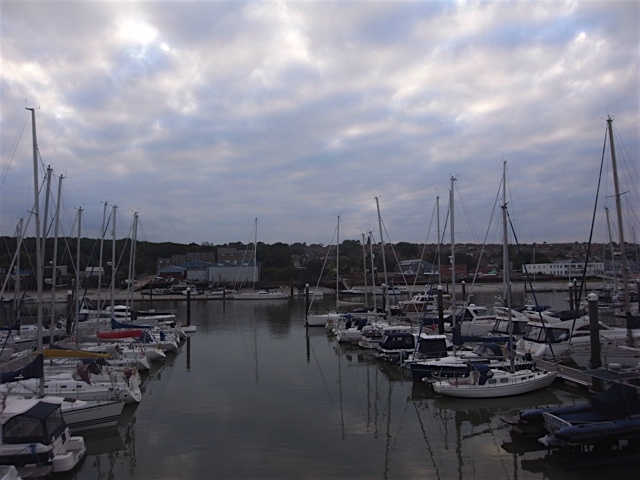 We spent two and a half days in Cowes and I was very sad to leave it. However leave we must. 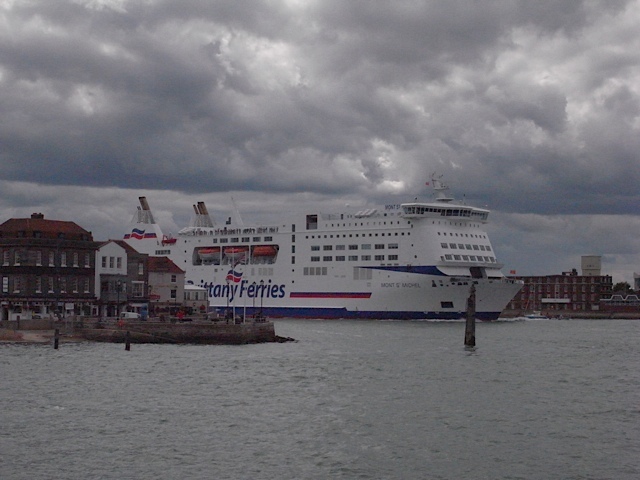 So my Husband took me back to Gosport and dropped me off at the marina so I could get the train from Portsmouth harbour, so it was back on the Gosport ferry for my last trip, and on to a train home. But before that I want to share some more pics. 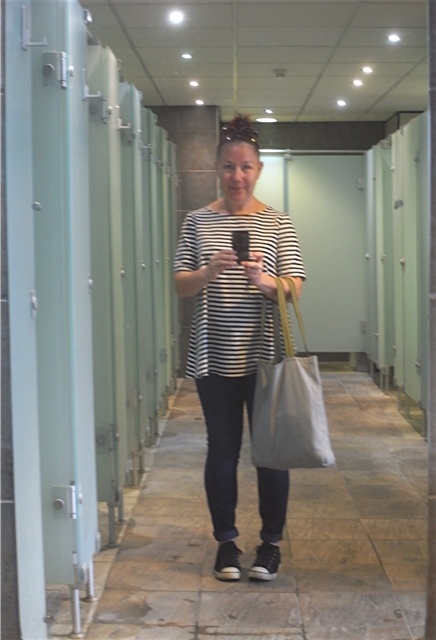 Me wearing another of my tops and using my bag. This was in the shower block at East Cowes. Watching my Husband on Kooshty motoring up the harbour as he sets off for home. He’ll take 3 days as he’ll not do it in one go. I love this picture. 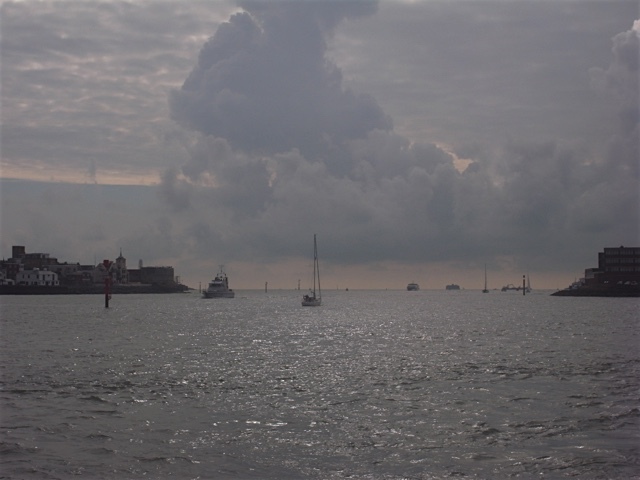 I was sitting on the Gosport ferry and thats our boat in the centre of the picture as he sails away! I enjoyed our little holiday very much and look forward to hopefully getting more confident and maybe going further. I hope you don’t mind that the last 3 posts haven’t been about sewing, but this is my other passion. I last went to the Isle of Wight about 15 years ago and hated it! Have never felt the desire to go back. Oh wait tell a lie, have been to East Cowes twice on a boat but only saw a small bit of the town and still wasn’t very impressed. 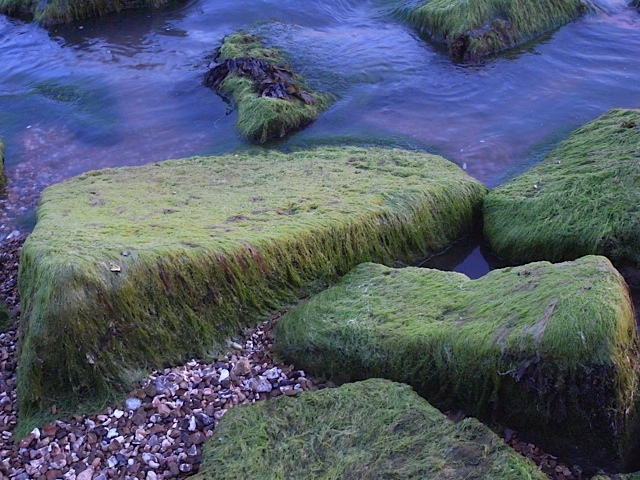 So the feeling that I wanted to go to the Isle of Wight took me by surprise. 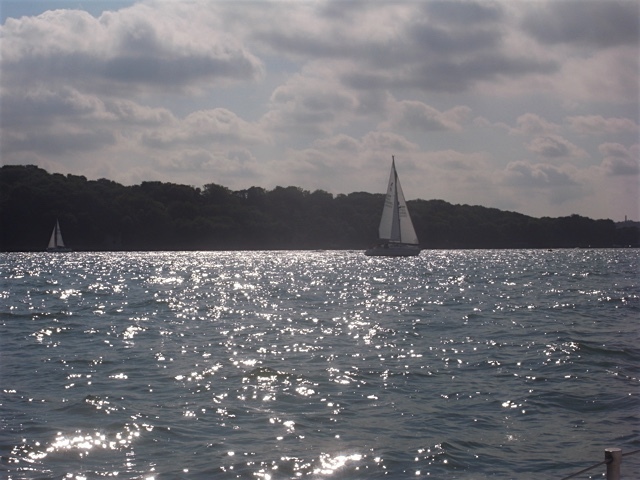 I think it had more to do with wanting to sail again and Cowes being the nearest to us. Anyway I was excited and anxious to go there. Once we’d arrived, and I’d like to say what a good job my Husband does of getting the boat out of and into its berth on his own. I am still no use on the boat, I’m just company and the coffee maker. So hats off to him! 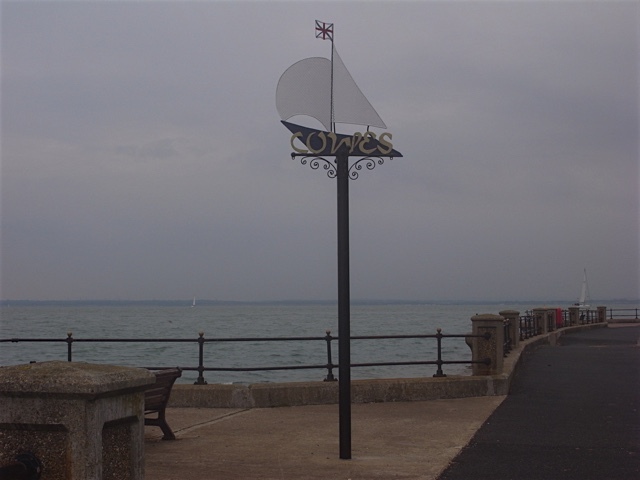 So back to the story, once we’d arrived and freshened up we took a walk into the town of East Cowes, and found a very lovely esplanade, with fantastic views over the Solent and looking over to the main land and also of Cowes. We had a walk along the esplanade and watched the coming and going of all the nautical activity. Here’s some pics of this wonderful thing. Its full of these interesting little art works that I loved. They’ve put a lot of effort into making it fun and quirk for the time it takes to get from one side to the other is probably less than a minute. 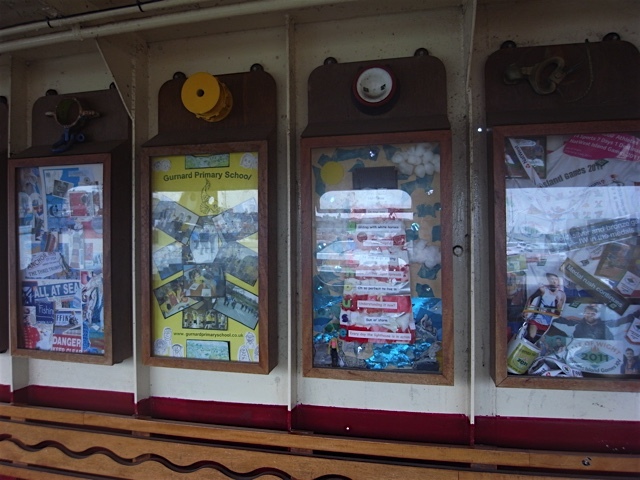 However it takes cars as well as foot passengers and you probably wait longer to set off than it takes to cross, so these quirky little art works give you something to look at, if you don’t want to look at whats going on outside on the water. Seriously though I can’t tell you how much I loved this! 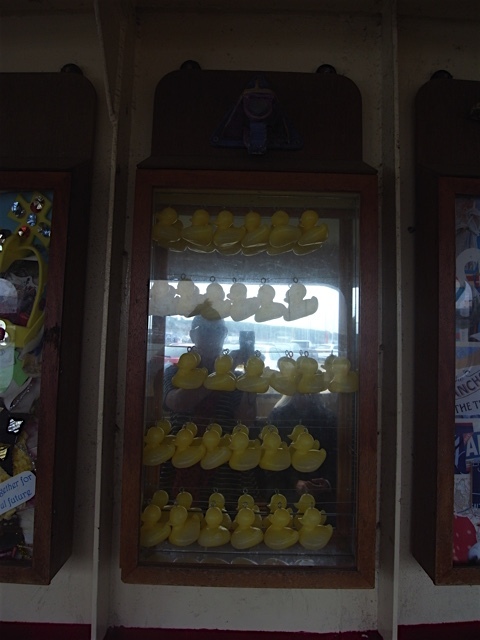 Once in Cowes I discovered a town full of charm and wonder. 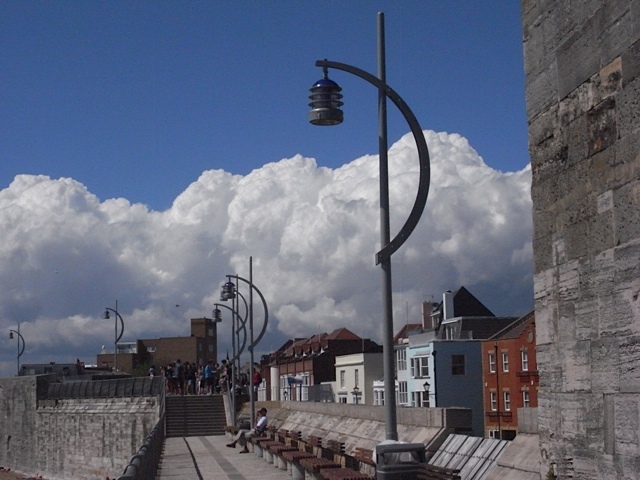 Cowes also has a fantastic esplanade which we spent two days walking up and down, with a lot of sitting and enjoying the views. Above is a wonderful place where we had a gorgeous lunch one day. The old shop front is just beautiful. 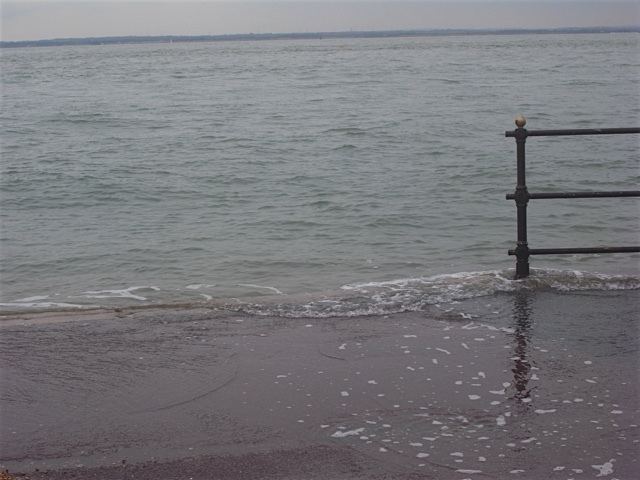 The sea does like to try and get on land here. 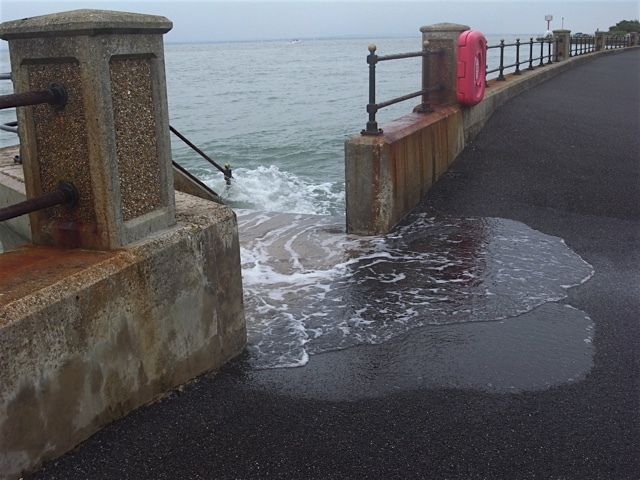 It was pretty much hight tide when we arrived and this is how it goes. 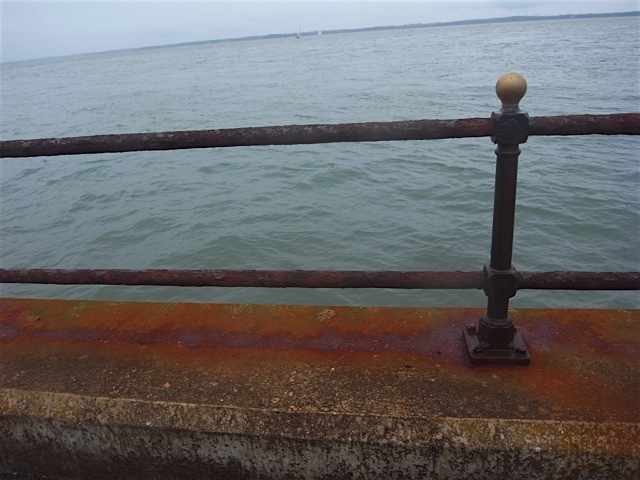 I love the colour of the rust. 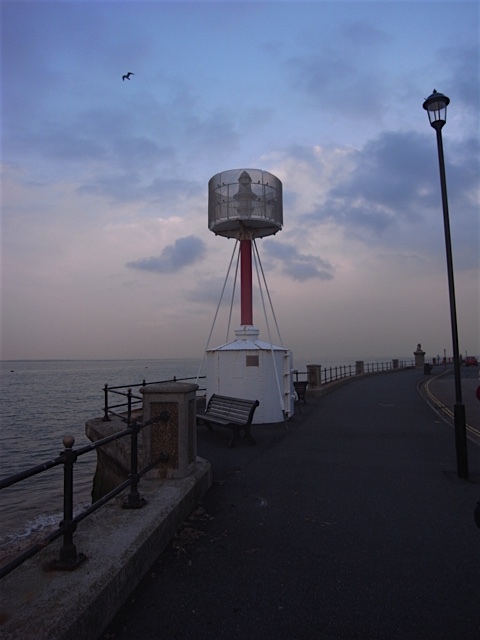 I think this is called Egypt point, which is a nautical navigation mark, I believe. 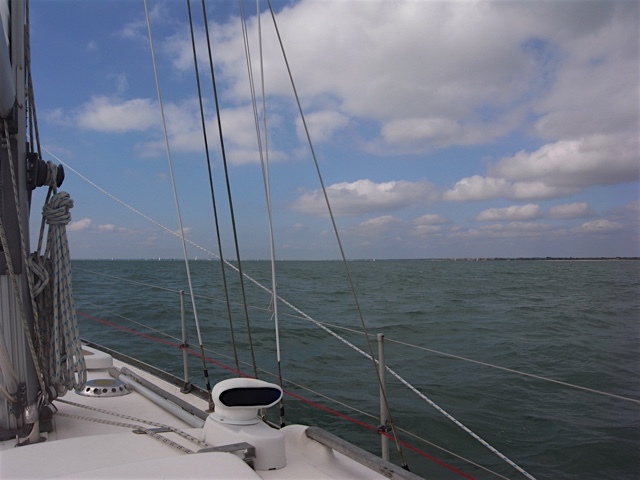 Husband and I had two weeks off back in September and so we trundled off to the Solent again. He went first taking our boat to Gosport and I hopped on the train the next day and met him there. 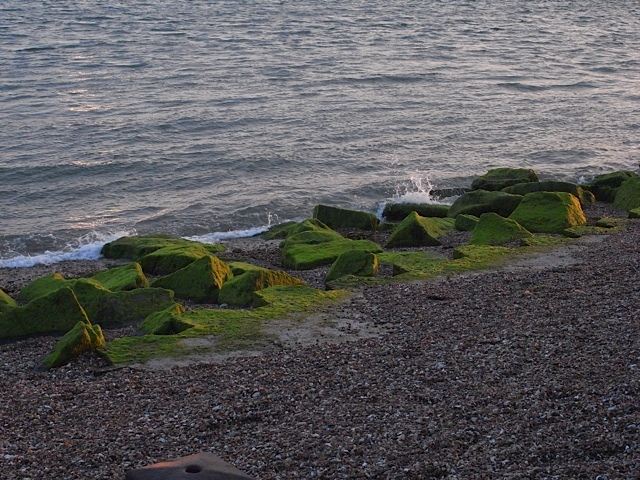 I can’t tell you how much I love going to the Solent and the areas around there. 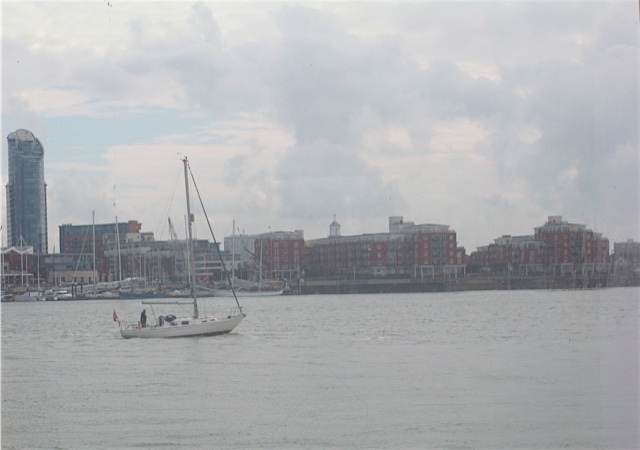 I love love love Portsmouth and I love how getting from Gosport to Portsmouth is a little ferry ride away via the Gosport ferry. 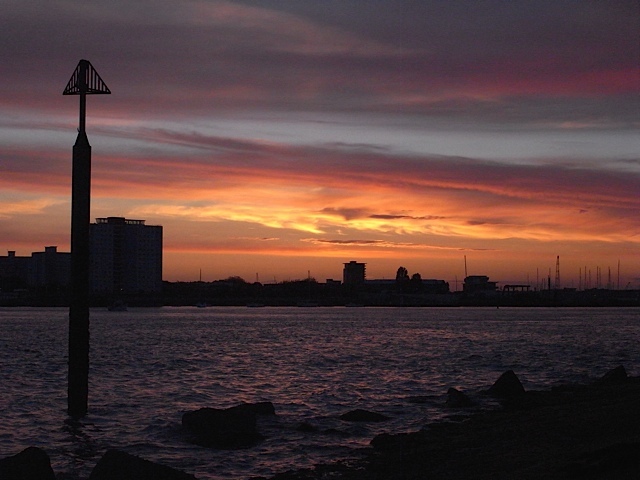 I love that if you live in Gosport and you have no interest in boats (but why wouldn’t you?) your day to day life still depends on getting on a boat to get you quickly from one side of the harbour to the other. 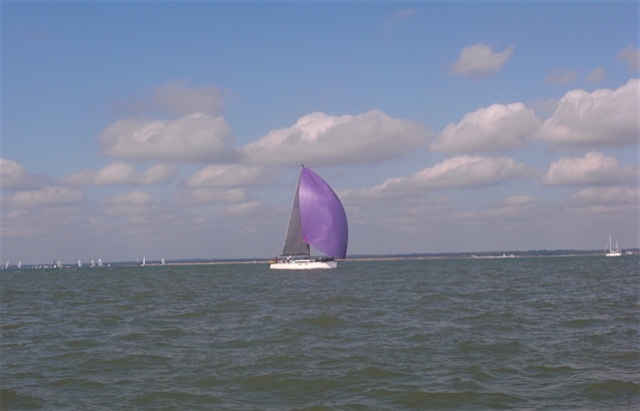 Its the same in Cowes on the Isle of Wight, but more about that later. 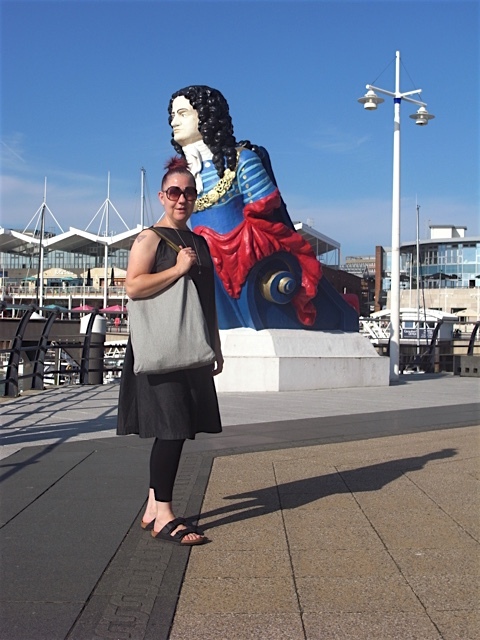 Here I am in Gunwharf quays. It was really hot when I arrived and stayed like that for a couple of days which was nice. 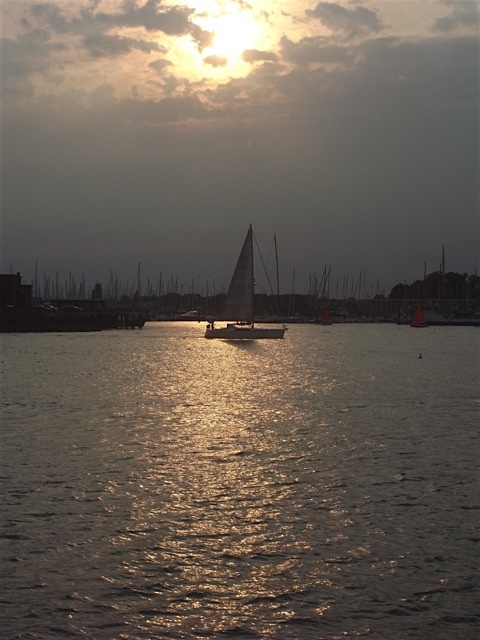 I do love a sunset picture with boats. Taken from the “Still and West” pub. On the pontoon at the marina. This dress came into its own in the hot weather. I can’t tell you how much I love it. And the bag is proving to be pretty damn useful too. 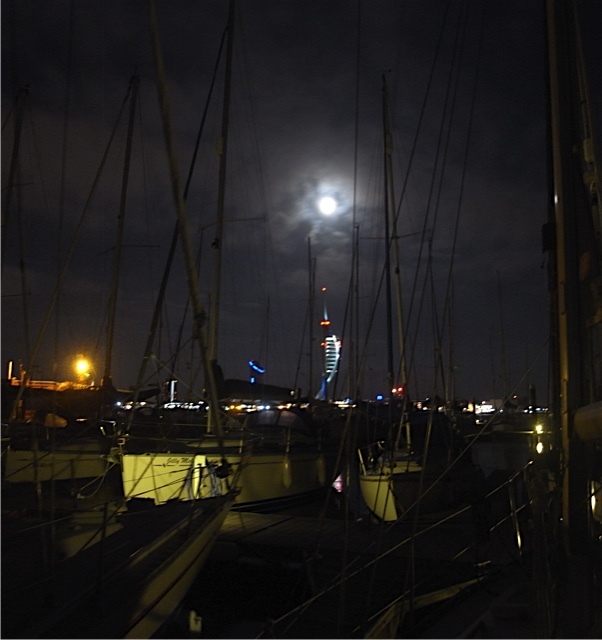 Lovely night time view of the Spinnaker tower form our boat. 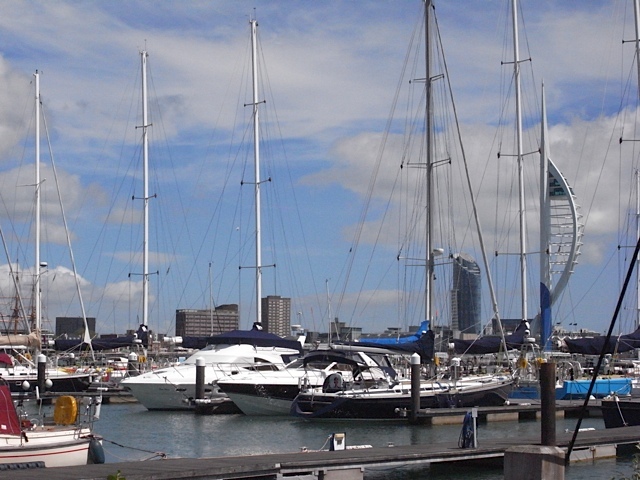 We spent about 4 days in Gosport/Portsmouth and then we moved onto Cowes. Now this is the bit that is a major achievement for me. 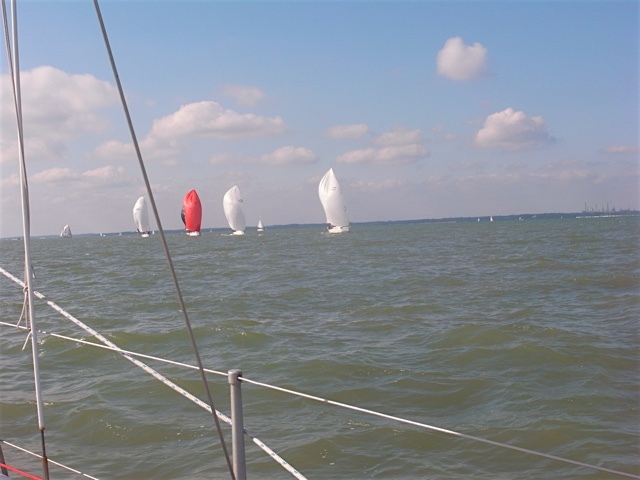 Although I have sailed a couple of times now at Eastbourne, sailing on unfamiliar waters is a different story. 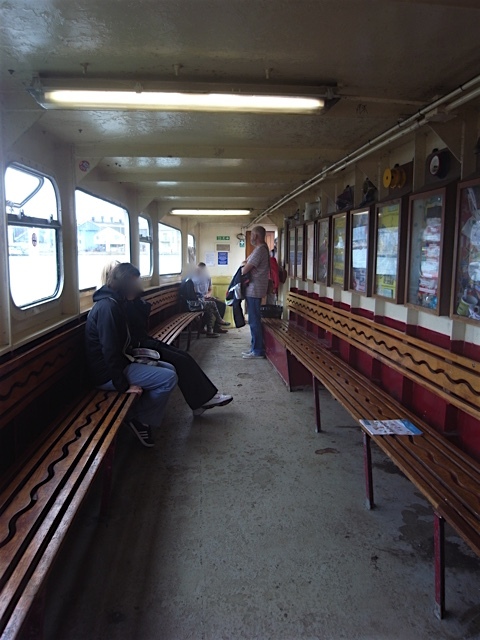 It was only a 2 hour journey from Gosport to Cowes but I was still quite anxious. There is just so much traffic out on the solent. There are boats everywhere! Big ones, little ones, fast ones, slow ones. EVERYWHERE! You have to keep your eye on the ball at all times. You can be sailing along quite happily and if you’re not paying attention you look around and there’s a bloody great container ship coming up behind you. 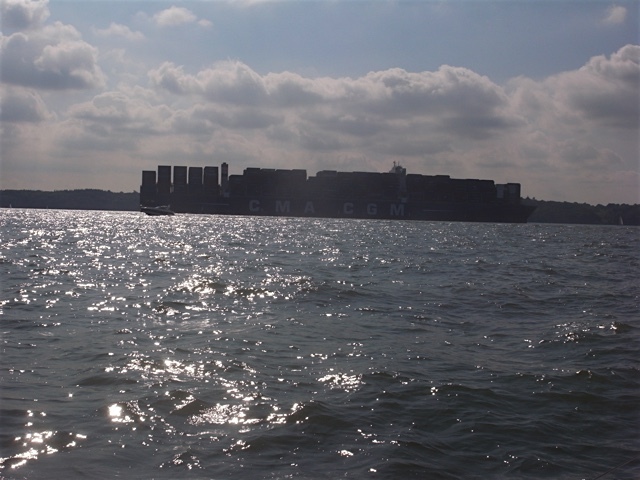 However we do keep an eye out so we saw the bloody great container ship when it was still a way off, but boy do they gain on you fast. I sort of relaxed into it after a while and started to take some pictures. I Love this one above. 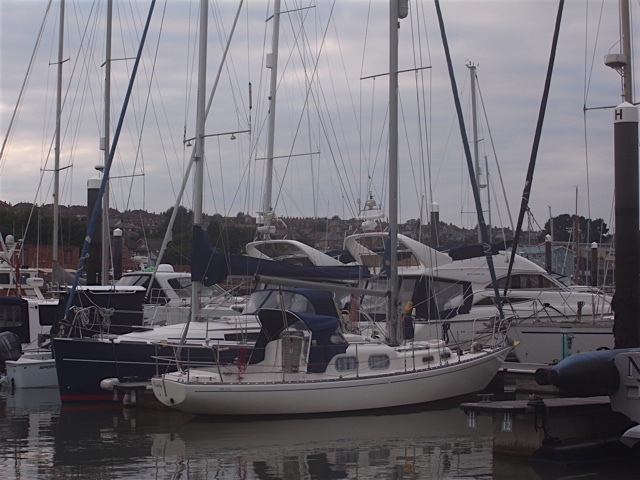 And below is our little boat in her berth at East Cowes marina. She’s usually pretty much one of the smallest boats in the marina, but we love her. Can you spot her in the above picture? Just realised I have many many more pics I want to share so will break this up into two or more posts. Most of the people that know me well, know I’m not a very sociable person, and I keep a pretty tight knit group of friends around me. I may not see them very often but we know we are there for each other. The work I do, involves meeting and mixing with lots of different types of people and having the ability to get on with them. Which I think is why I’m mostly quite happy with my own company. On my days off its quite nice to just not have to talk. Now don’t get me wrong, there’s also nothing I like more than a nice piece of cake and a coffee and good old gossip with friends too. Just not every day. Since starting my little sewing journey I’ve almost become more of a hermit than usual. 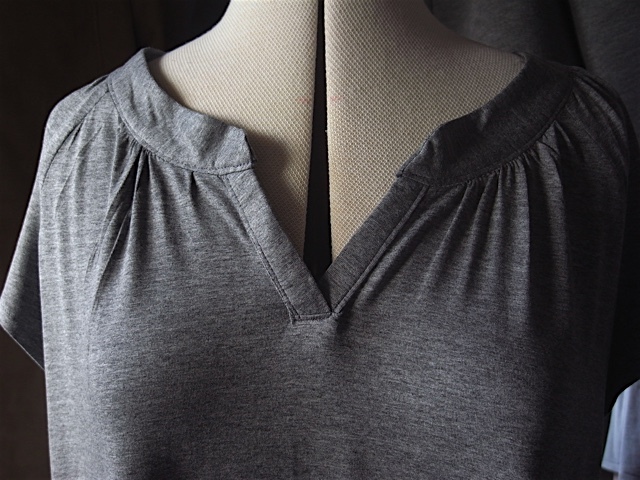 Probably because for the most part sewing is a very individual activity, and I’m very happy being at home and making my tops. 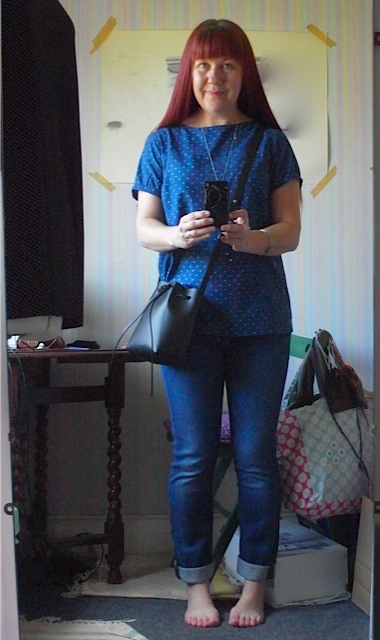 I started blogging to document my sewing for myself, so I can see how far I’ve come and what I’ve been doing. A personal record of my work, and if anyone reads it thats great, but I write it for myself so I’m not worried if nobody else reads it. Well we exchanged comments on each others blogs and found we had a mutual love for Merchant and Mills, and one day she’d commented that she might be popping down to Rye to visit M&M. This comment floated round my little brain for a while and I wondered if she might like to meet me in Rye, I never so no to an excuse to visit. 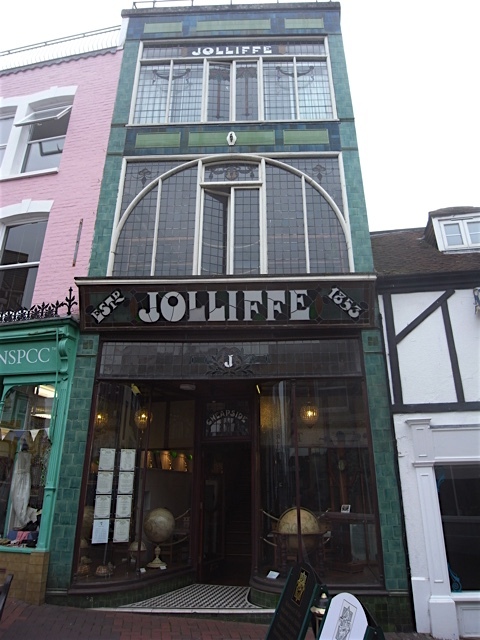 Eventually I plucked up the courage to ask her if she’d been to Rye yet and when she said “no” I took the plunge and offered to meet her if she did plan to visit. And she took me up on the offer. About a week later I met up with her and her lovely daughter in Rye, and we went to M&M where she bought some lovely things (I’ll leave it up to her to say what she bought on her blog, can’t wait to see the finished result) and I of course also bought some more lovely fabric of which I didn’t need but couldn’t resist. We then went for lunch to one of my favourite places the Apothecary coffee house. Had a lovely chat, such a warm and friendly person. After that we had a another little wander and then parted ways. I’m so annoyed I forgot to take my camera and take any photos to share but trust me it was a lovely day. 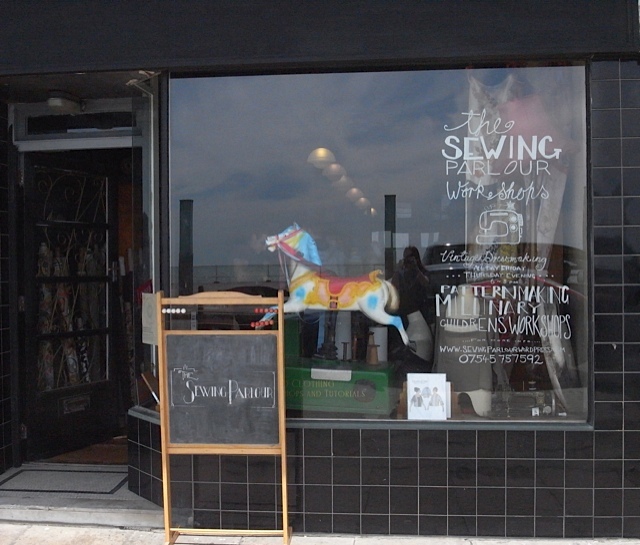 And then blow me down during the following week I got a Tweet from the lovely “sewing parlour/La La Rookh workshop” (they changed their name the week after my visit to “La La Rookh” ) inviting me down to visit as they would love to meet me! Meet me! Well I was flattered beyond belief and of course said yes. and then self doubt crept in. why would they want to meet me? What on earth would I possibly say… and so on? I went back and forth for the rest of week about whether I would go or not, but then on the Friday evening I made up my mind that I would go. Of course there was always time for me to change my mind, I wasn’t going till the following afternoon. Saturday came and I was still in the mind set that I was going. This was feeling good. 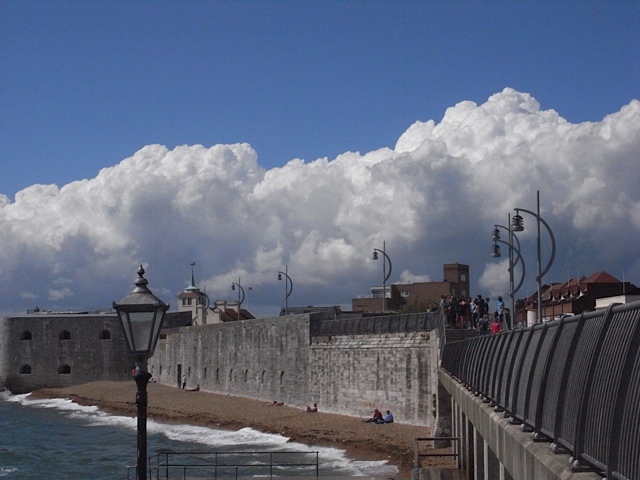 I was a little nervous, but I had a nice little walk along the seafront (not too far as I took the car, didn’t want to arrive all sweaty). Had to take a pic of the sea and sky. And then I arrived outside and thought it would be a good idea to take a photo of the shop front. Of course it looks a little different now after the name change. I walked in and was given the warmest of welcomes by two of the loveliest ladies you could ever wish to meet. 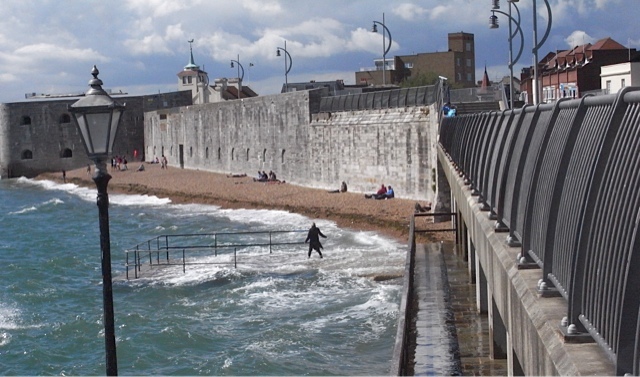 Even though they were sort of in the middle of an informal meeting with a local entrepreneur and founder of Hastings Voice. I became included in their conversation. And very interesting it was too. Afterwards I was invited into the workshop part of the shop and given coffee and cake. And we just sat around chatting about all sorts of lovely things. I would love to chat to Anna (owner of said workshop) more about her skills, I get the impression she’s a very talented lady but doesn’t really shout about it. And Lexie is a very talented lady too, take a look at her blog Those words she wrote, truly a gifted writer, she really has a way with the words. Together they are chatty and funny and I felt like I’d known them forever. Time passed all too quickly and I had to leave. Of course I didn’t leave empty handed, always good to have a look at the fab array of fabrics she has. Always so difficult for me to capture the true colour. Another gorgeous Indian print cotton. And here’s a pic of the two fabulous ladies themselves. Anna on the right and Lexie on the left. I can’t wait to go back again and hopefully get to know them a little better. I think what I’m trying to say is, that sometimes its good to put in a little effort and meet new people. You just never know who you might come across. I’m still a mostly unsociable bugger but sometimes I come out of hiding! 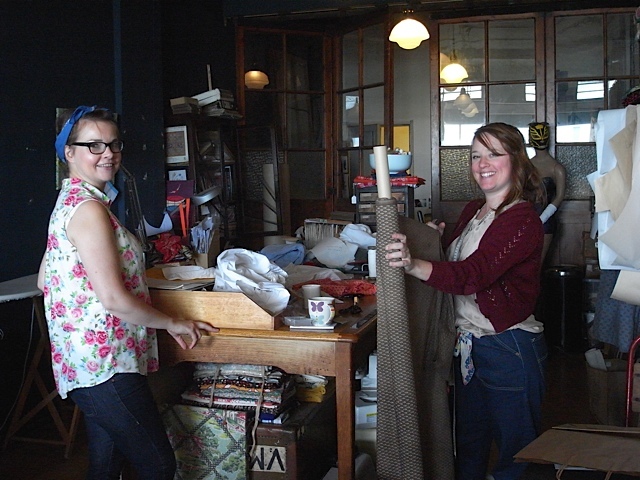 I didn’t do much sewing in July, for a couple of reasons. I had some time away with my husband and I started exercising again. Its taken me a little while to get back in the swing of exercising and being able to sew on the same day, but I’m getting there. However this post is about my little holiday with my Husband. I’ve lived by the sea all my life but its really only the last 10 or 15 years that I’ve truly learned to love it. I can’t be away from it for long, I get a bit antsy if I am. Last year we had 10 days in Florence, and whilst I loved it I couldn’t help but feel something was missing. I can just about see the sea from my house if I kneel on the back of my sofa and look out the side window. And I can see it whenever I leave my house, so long as there’s no mist/fog. I find it reassuring just knowing its there. So when I have a holiday I generally like it to be near the sea. Now don’t mistake this for beach loving, I’m not particularly fussed about lying on a beach and trying to tan ( I don’t). I do love walking along the beach and will love a paddle if its warm enough, but I also love a good stomp along the beach when its blowing and the seas rough. All in all I just love looking at it. Love it love it love it! 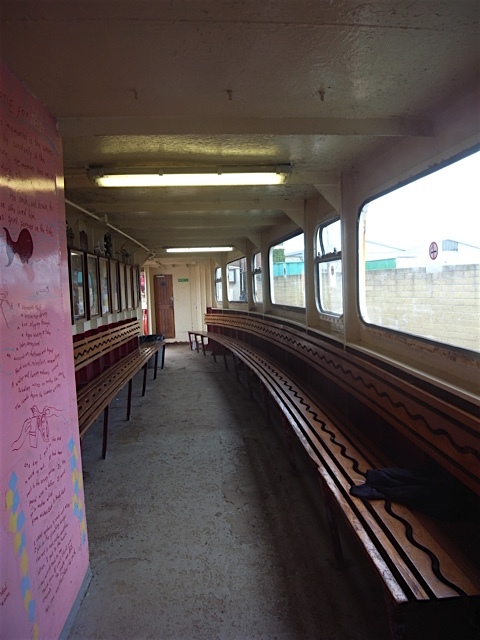 If you’ve been reading this blog from the beginning you’ll know we have a boat. Nothing fancy, but still its a boat. Her name is Kooshty, which does not in any way resemble my sailing experiences! I tried it for a good 4 years before I chucked in the towel. I’d had one too many bad weather experiences and plenty of wind in the wrong direction (its just no damned good when its coming from the direction in which you wish to go, which is what it usually does). And I finally had to admit to myself that I didn’t enjoy it. The Husband was disappointed but understood. I still love the boat and have no problem whatsoever sitting on her in a nice comfy marina. 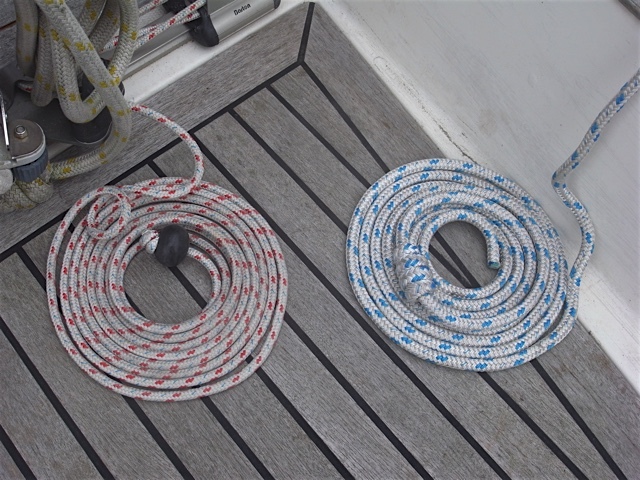 Marina life can still get lumpy (thats a sailing term for rough) and we had at least one night of strong winds howling through the rigging and the boat rolling around in its berth, so much so that we might as well have been at sea! However when my husband takes her away I still like to go and join him if I can. 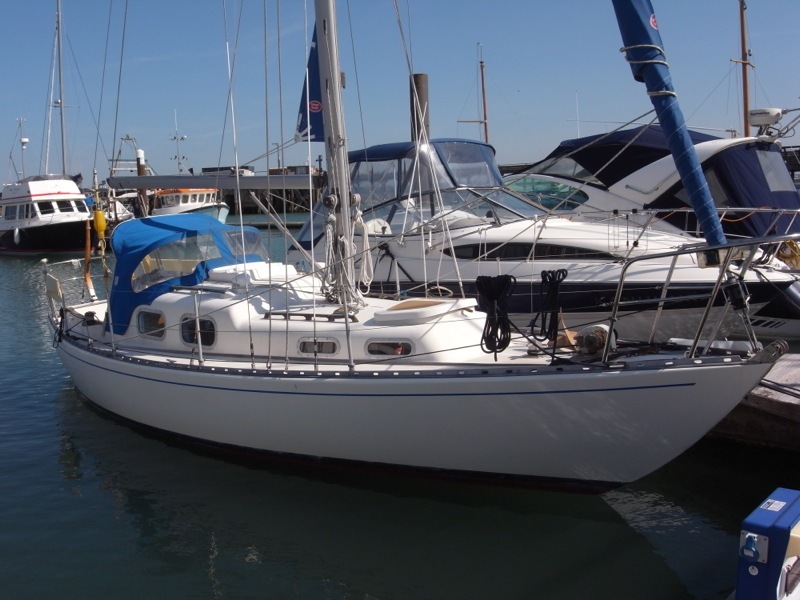 In July he made his way down to the Solent and moored Kooshty in Gosport Premier marina. 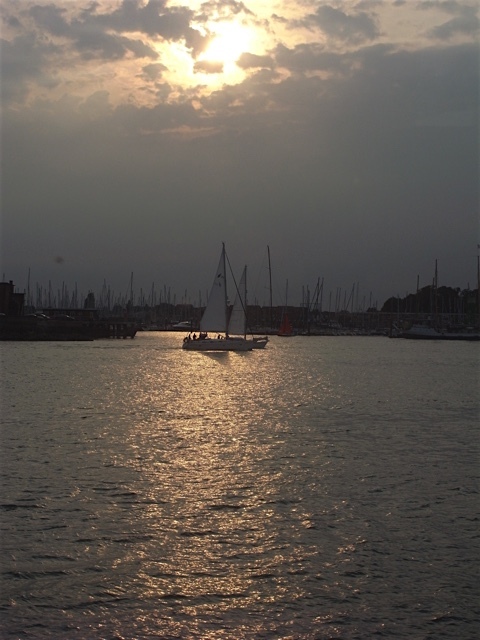 Its quite a nice train ride for me to Portsmouth harbour station and then a short ferry ride across the harbour entrance to Gosport. Takes about 3 hours (train journey not ferry) and I am reunited with my sailor hubby and our boat. 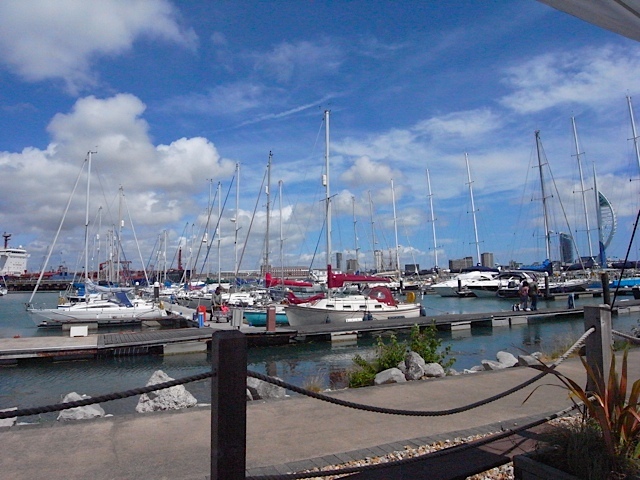 I love the marina at Gosport, it has fabulous views and lovely little cafe/bistro which also has gorgeous views from its terrace. Doesn’t get much better than this! Or this. Great view of the Spinnaker tower. 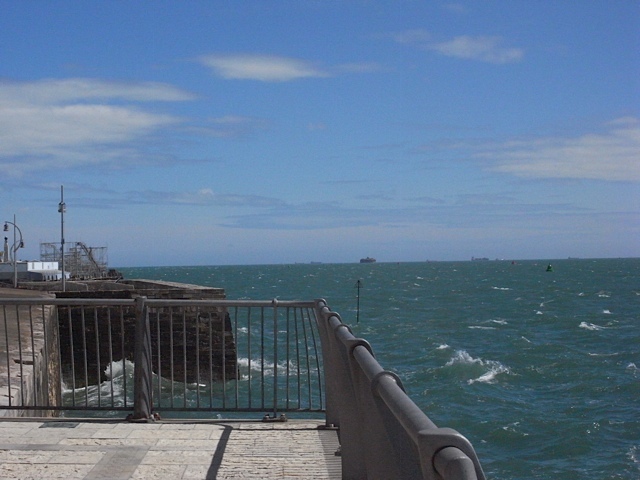 My husband and I spend most of the time over the other side though in Portsmouth and particularly Old Portsmouth. Just love standing on the beach there and watching the coming and going of the big ferries and little yachts. Big ferries like this Brittany ferry. And taking pictures of dramatic sunset skies. 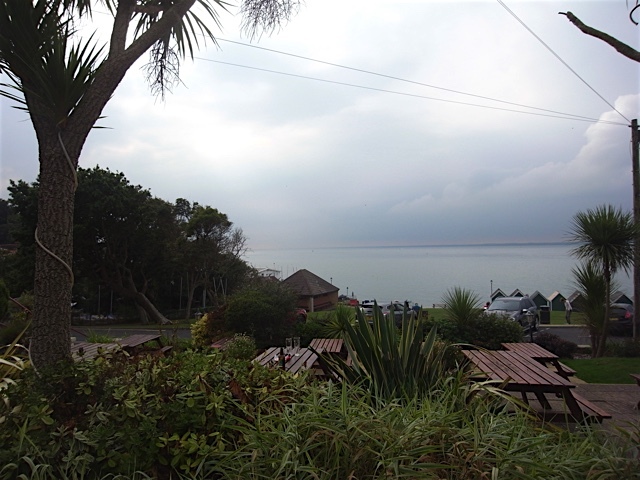 I won’t lie, there also happens to be a pub, the Still & West, with the best view in the world (Ok slight exaggeration ), and we do like to sit by a window and drink beer and watch the coming and going of the water vessels from there too. 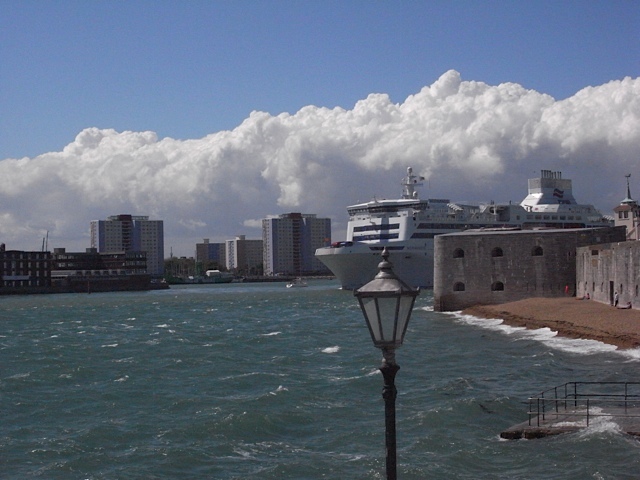 Picture taken from Gunwharf Quays in Portsmouth looking over to Spice Island in Old Portsmouth. You can just about see the Still & West on the right next to the ferry. when the big boats are coming out of the harbour they can sometimes look like they are heading straight for the pub. Fun! 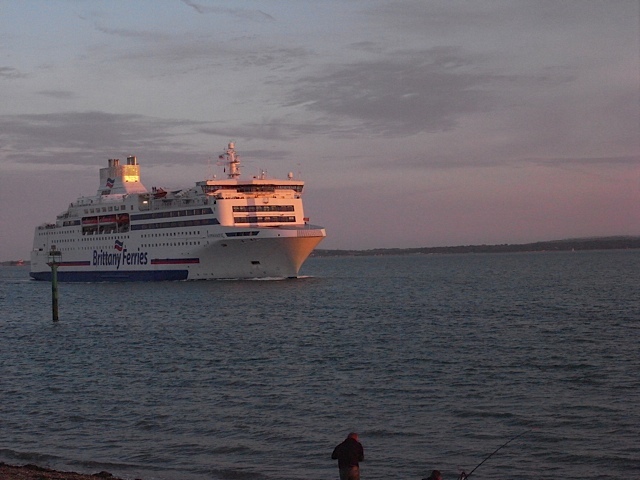 Look at those gorgeous clouds, and a Brittany ferry coming out of port. Love it. 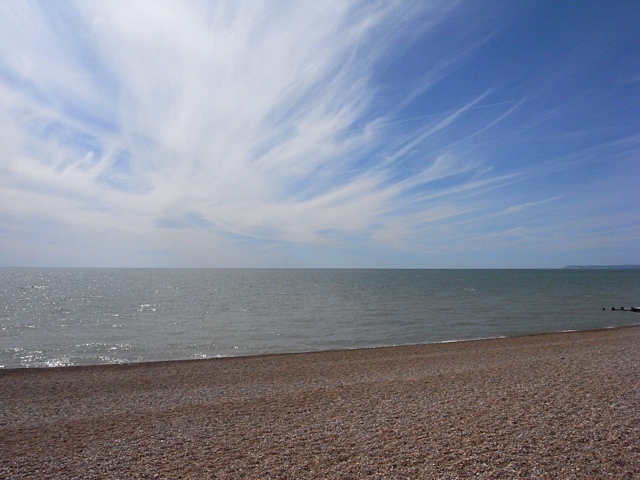 I took loads more pictures of the clouds but they are all very similar, so I won’t bore you with them all! Now for some of the sea views. The colour is so vibrant. Had to take a pic of this crazy lady standing in the middle of pier type platform. The sea was quite rough this day, lucky she wasn’t washed away! I love this pic. 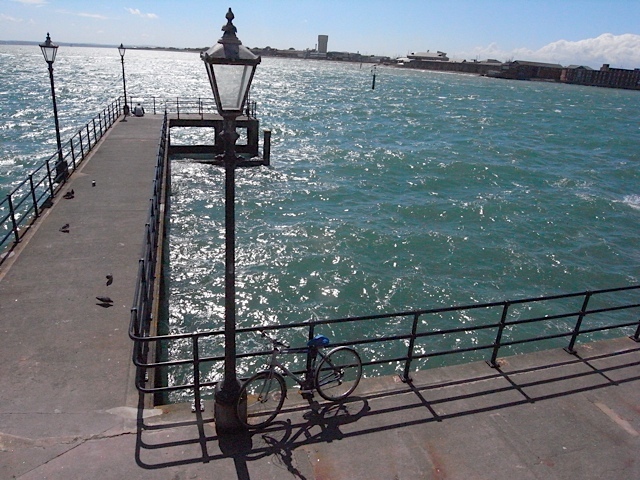 Something about the bicycle and the lamp post. Well I think thats about it for now. I spent 5 days with the boat and husband and loved it.